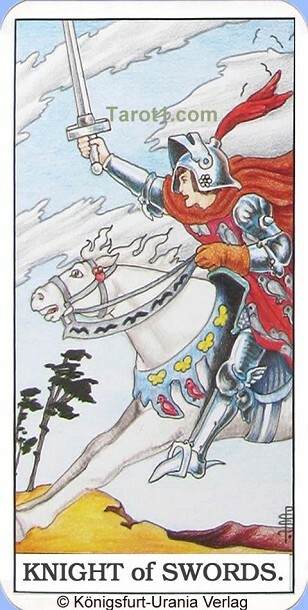 On this Tarot card the knight of Swords is riding in gallop. He is loudly shouting and he makes an attack in the battle. In the background, a strong wind blows and you can see how the trees are bendinig in the wind. This card shows you that stormy times will come to you. A hostile atmosphere is approaching, with anger and disputes. In your partnership are a lot of quarrels. Watch out that it does not escalate into a fight. It has become cold to both of your hearts. Try immediately stop the disputes. Try to clear the air with love and understanding, then you maybe are able to save your relationship. In your job you will have a heated argument today. Your boss will be pretty angry with you and he will criticize you really vicious. Be open and receptive to him. If you did not made this mistake, tell him with a calm voice. Also privately you will now feel aggressions today. Take care when driving that you do not release any aggression in road traffic!